married children and nine grandchildren. Some of the churches Pastor Donald served as Senior Pastor are Windom EFC, Trinity EFC of Lakeville, EFC of Willmar (all in Minnesota). For hobbies and pastimes he enjoys walking, biking, kayaking, Nordic skiing, snowshoeing - all enjoyed more with Pam. 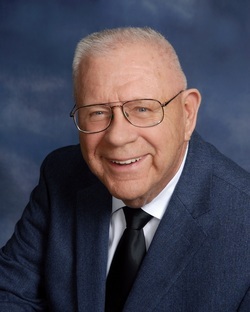 Pastor Jim Brown grew up in Annandale, MN graduated from Trinity College and Trinity Evangelical Divinity School in Chicago and then served EF churches in Spirit Lake IA (1961-71) and Rose City, MN (1971-99). Following retirement in February 1999 he enjoyed some time for rest and relaxation. In April 2001 he was invited to join the staff at LEFC as a part-time pastor serving as a community life pastor. Pastor Brown enjoys co-teaching Sunday School with his wife, Irene. They are both very involved in serving in many areas of the church. He enjoys walking, fishing and the wild life in the area. The Browns enjoy spending time with their three sons, three daughters-in-law and seven grandchildren.